You'll be £14.99 closer to your next £10.00 credit when you purchase Yom Kippur. What's this? On the afternoon of 6 October, 1973, the colossus of the Israeli Defence Forces was awakened by a wave of airstrikes, followed by an artillery bombardment along the Suez Canal that preceded a meticulously planned Egyptian invasion of the Israeli-held Sinai. Simultaneously, a massive Syrian armoured assault bore down on Israeli positions on the Golan Heights. The day was Yom Kippur, the most holy day on the Jewish religious calendar, and the commencement of a war that would bring the young state of Israel to the very brink of defeat. In the aftermath of the Six-Day War of 1967, a stunning Arab reversal at the hands of the untested Israeli Defence Forces, Israel occupied and held Arab territory on the West Bank, the Sinai Peninsula and the Golan Heights. These were for the most part territorial buffer zones, retained to protect Israel against an inevitable future war, but their ongoing occupation remained an open diplomatic wound. In the meanwhile, a mood of complacency came to affect the Israeli military machine, in the belief that air and armoured dominance of the battlefield would, as had been the case in 1967, guarantee a quick victory in any future war. The Yom Kippur War proved the fallacy of this belief, revealing critical weaknesses in Israeli intelligence capability and battlefield strategy. The ferocity and effectiveness of the combined invasion pushed the much-storied Israeli armed forces almost to the point of collapse. Only the rapid resupply of arms and equipment by the United States, and a display of extraordinary reliance and determination by the fighting forces of Israel, rescued the young state from annihilation. The story of the Yom Kippur War is an object lesson in the dynamism of military thinking, the evolution of battlefield technology and the uneasy alliance of east and west during the Cold War era of détente. 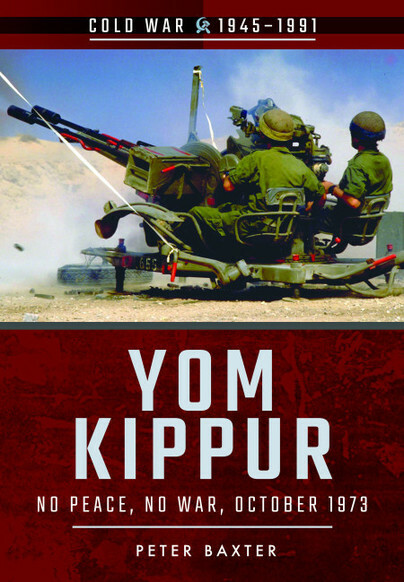 Yom Kippur was both a military and political manoeuvre that adjusted the balance of power in the Middle East, and set the tone for the ideological stand-off that continues in the region to this day. The troubles between nations in the Middle East continue, but the effects of the Yom Kipur War were a significant milestone in the history of the region and this explains all the complex issues very well I felt. On the whole, it is a valid and in-depth work that provides both experts and simple enthusiasts with a broad and documented picture. This addition to the Cold War series provides a very capable overview of the Yom Kippur War and how Israel snatched victory from the jaws of defeat. The Cold War series is developing nicely and building its readership. This new book in the series follows the now established format with many photographs and commissioned sketches and drawings – Highly Recommended.